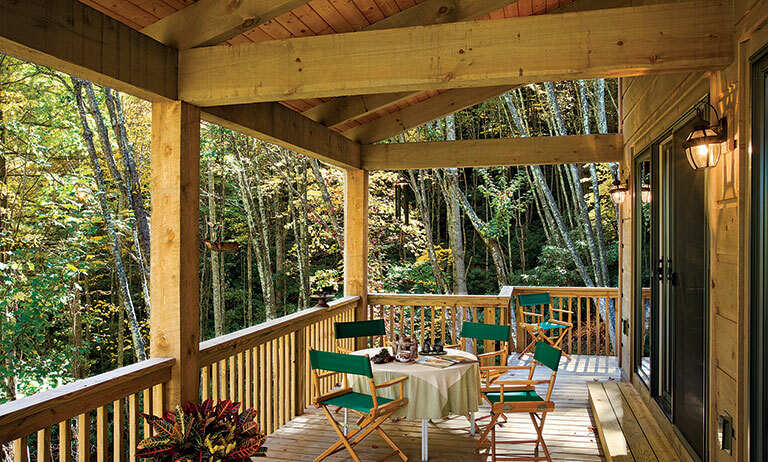 A coastal couple builds a family getaway in western North Carolina. 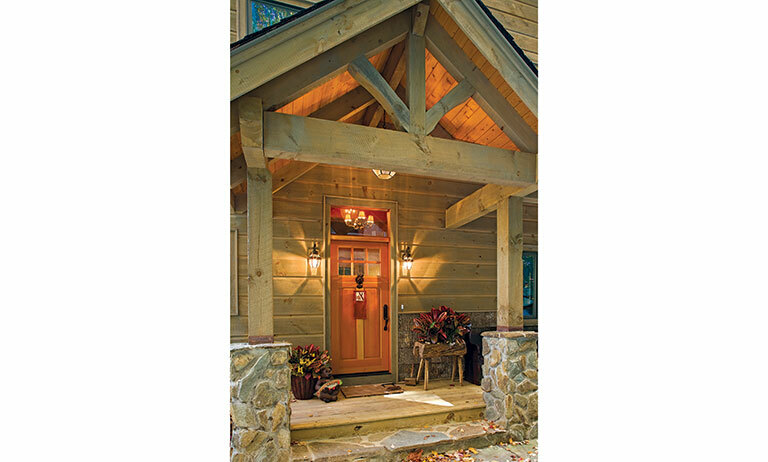 With encouragement from friends, Nancy Pollack and her husband David were looking for property in western North Carolina where they could build a second home when they came across a timber-frame house under construction in Watauga County. They took a peek inside, and it was love at first sight. They contacted Daniel Krumm of Trinity Timber Construction Inc. in Banner Elk, the builder whose sign was outside the house, and not long after bought a nearby lot he had for sale in the Chestnut Hill gated community. Back in her Morehead City, North Carolina, home, Nancy started sketching alterations to the floor plan that she’d seen. The result of their collaboration is a 3,800-square foot, four-bedroom home, an inviting retreat for the Pollacks and a family that includes four children and five grandchildren. Built into a steep hillside, the house has three levels plus a loft. On the ground floor is a deep garage, an office, a den and a reproduction English bar. The main level includes the master bedroom, plus kitchen and dining areas. Upstairs are three other bedrooms and entry to a loft. Driveway access for vehicles is available on both the lower level and the main level. Outside the lower level is a fire pit and Jacuzzi, allowing the family to make the most of the site and its surroundings. Ceiling heights are set at 10 ft. so the heavy wood frame doesn’t feel too imposing. Nancy says a good lighting plan that includes spot and accent fixtures also helps. 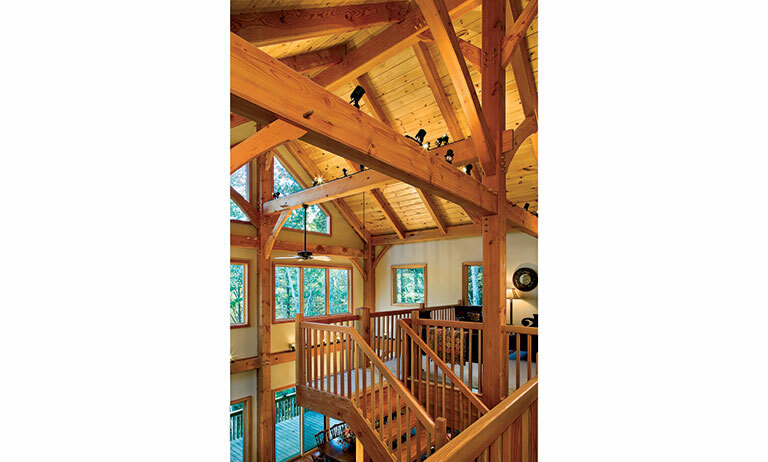 The design ideas were turned over to Bob Sternquist at Timbercraft Homes, which developed architectural drawings and cut the frame. Sternquist, the company’s president, worked with Krumm to set the frame and Krumm’s crew completed the house. The frame is wrapped in structural insulated panels filled with polyurethane foam, R-24 in the walls and R-40 in the roof. Because the house is so tight, Krumm included mechanical ventilation to introduce fresh air. When the family gets together, cooking, eating and conversation are a big part of the experience. Nancy says the home’s design enhances that. And enjoying Trinity’s craftsmanship is part of the experience. Massive beams at the covered entry are a hint of what’s inside. First-time visitors enjoy a jaw-dropping moment when they open the front door and see the 30-foot exposed timber frame. There are views of the surrounding mountains and forests from every floor of the home. 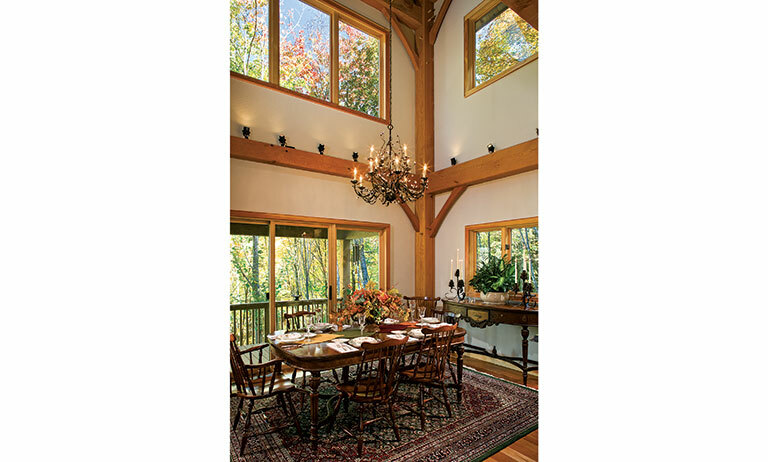 The soaring ceiling above the main floor is the backdrop for a more formal dining area. Sliding glass doors open to the deck. A 30-foot ceiling in the great room gives an open, spacious feel to the house, and an unimpeded view of what the owner calls “the bones” of the house. The kitchen runs the full width of the house and includes a small dining area at one end and an eat-in bar at the other. 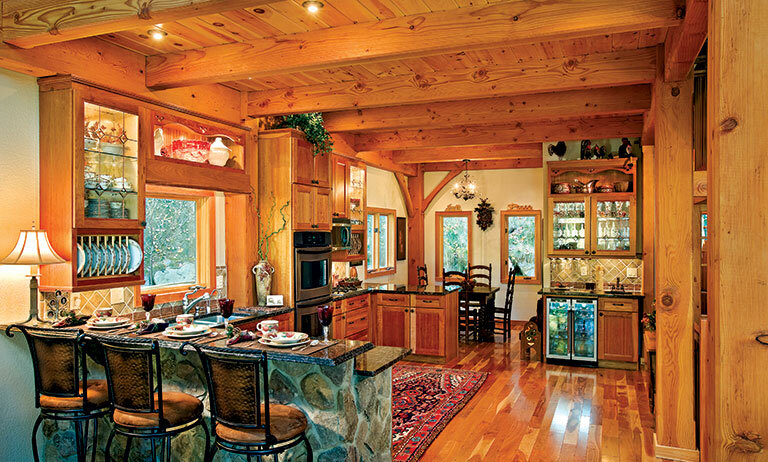 Floors and cabinets are made from cherry wood. 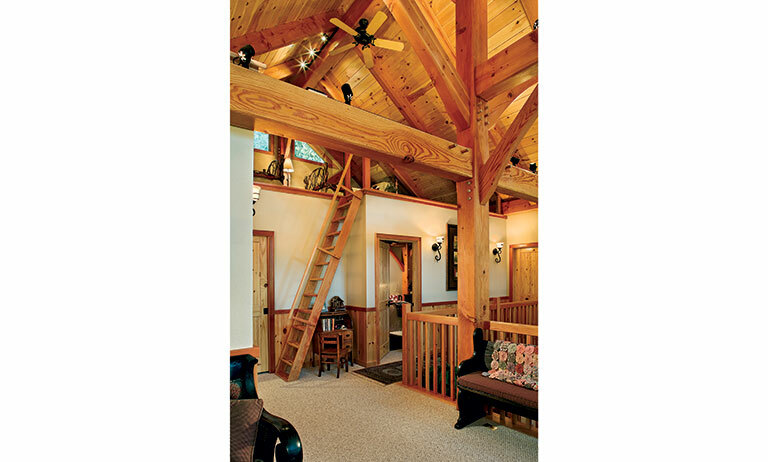 From the bedroom level, a stair leads to an upstairs loft where the owners’ grandchildren can bunk down. The tempered glass railing makes it safe for children without blocking the view. 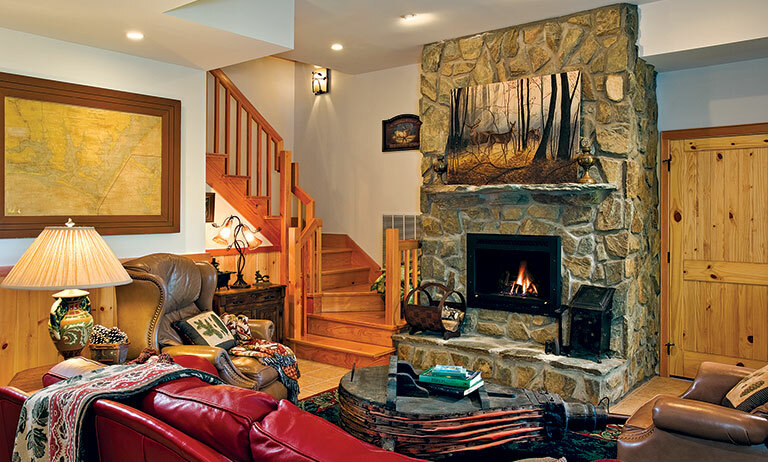 The lower level is warmed by one of three gas fireplaces. The painting over the fireplace is by the owners’ daughter.